Here's a superb new online slots from Microgaming which you can play. Looking for a slam dunk of a game? Get on court with Basketball Star and experience this great online slot from Microgaming complete with great wilds and tasty bonus features. Microgaming is one of the leading game's developers in the industry and pride themselves on bringing the most renowned games to the industry. It's games like Thunderstruck and many more branded official titles that separate themselves from some of the leading designers across the world. With over 20 years in the industry pioneering and innovating within the slots market, Microgaming is really scoring those three-pointers. Who says you can’t be Michael Jordan without leaving the comfort of your own home? This action-packed, high octane sports slot with put you centre court - and with the crowd cheering for you to win big, you could be slam-dunking your way to the big prizes. Underneath the hoopla, cracking graphics and great action this is a 5 reel slot that anyone used to playing similar games will find it easy to get started with. Microgaming can be relied on for top quality graphics and there’s lots of really great basketball themed symbols to get your hands in this game. The Drinks Holder, Tactics Board, Gold Medal and Trainers are the lowest paying symbols, but if you land 3 or more of them on a payline you’ll still be in for a win. The crowd will go wild if you spin the reels and land the on-court action symbols including the dribble, the guard, the set-up and the slam dunk. These symbols will win bigger prizes, with the slam dunk securing you the biggest payout. Basketball Star logo wild – The game logo is also the wild and can substitute for all symbols in the game, bar the scatter, to complete combinations to get you a win. This wild can create a ‘stack’ with reel 5 having a 3 symbol stack, reel 3 having an 18 symbol stack and reel 4 having a 25 symbol stack. Wild Shot Feature – This is activated at random during the game and when it does one or two reels will become completely wild. It will only activate if the new totally wild reels can complete a combination. Rolling Reels - Rolling Reels will offer some amazing new ways to get winning combinations and is activated with every winning line except a scatter win. All symbols in a winning line are replaced by the symbol above it on the reel, and if that nets you another win, the reels keep on rolling! So with every win, you have the chance to immediately net another. 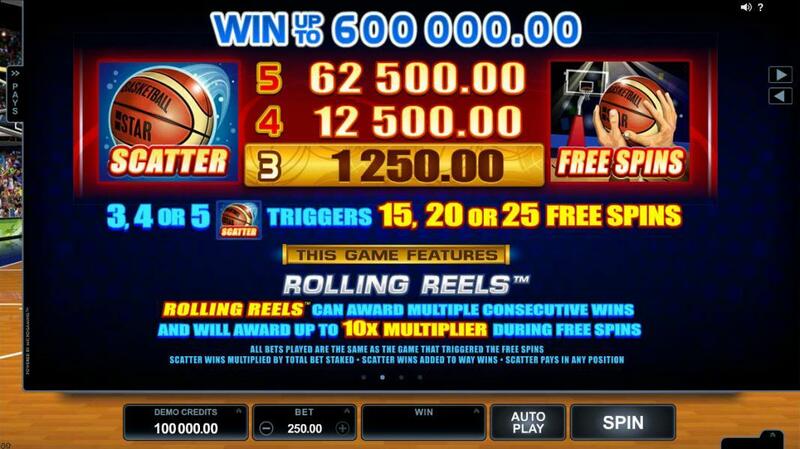 Basketball scatter symbol - Get 3 or more of these anywhere on the reels and the Free Spins Bonus round will trigger. Here you can get a maximum of 25 free spins depending on how many scatters you land initially. You’ll also get a multiplier for each rolling reel - up to 10x. 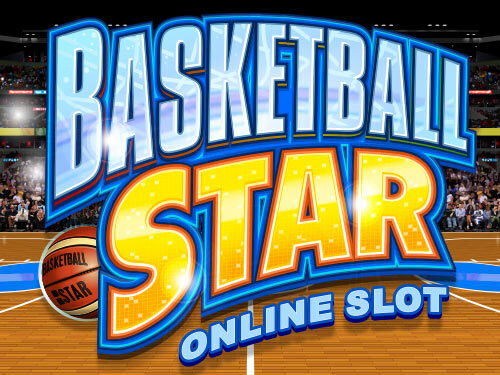 There are so many ways to win with Basketball Star, it’s an all-star online slot that belongs in the Hall of Fame. Great graphics, fun to play, and big prizes: win, win, win!